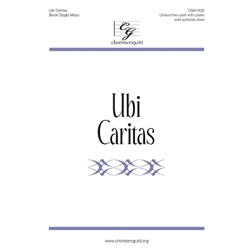 With a memorable melody, beautiful accompaniment, and lovely oboe part, you can't go wrong with Becki Slagle Mayo's "Ubi Caritas." A thoughtful choice for Lenten and Holy Week worship. Part of the four-piece collection CGA1327 Cantate! Sing to the Lord!